Crafting the perfect survey question isn’t just about what you ask; it’s also about how you ask the question. The types of questions you decide to use can have a major impact on the insight you’re able to gather, and could be the difference between an online survey that helps you make a more informed business decision and one that leaves you with more questions than when you started. 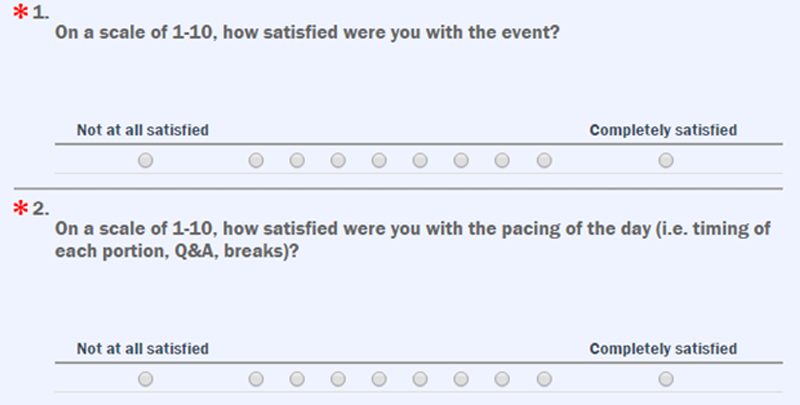 There are two primary types of questions you can ask in a survey: open-ended and closed-ended questions. This post will take you through when you should use each question type. Open-ended questions require your customers to answer the question in their own words. In summary, you should use open-ended questions when you aren’t sure what response options to put down or you are looking for unprompted, detailed feedback. Open-ended questions can also be great follow up questions, to ask your customers why they chose a particular response in a closed-ended question. Closed-ended questions require your customers to choose from a list of responses that you provide. For example, a small business curious about customer satisfaction might ask “How satisfied are you with our product?” with five responses options including: Very Satisfied, Satisfied, Neutral, Dissatisfied, and Very Dissatisfied. Closed-ended questions are also faster to summarize and analyze. You can look at what percentage of your customers selected each answer choice, or make a comparison between how two groups of customers answered a closed-ended question. Customers may feel frustrated having to make a choice between limited options. In summary, you should use closed-ended questions when you have a decent understanding of the attitude or behavior you are seeking to investigate and can come up with a set of response options for the question you are asking. Including an “Other” category will help alleviate any frustrations your customers feel when they are asked to select between limited choices. Deciding when to use an open-ended and when to use a closed-ended question is an important part of survey design. If you consider the opportunities and downsides of each question type, you will be on your way to collecting high quality data that your small business can use to drive marketing decision making. Have additional questions about creating a survey for your small business? Post your questions in the comments below.